Have you been ignoring a cavity in your tooth for a long time? An ignored cavity might have infected the pulp of the tooth consisting of small thread like tissues. 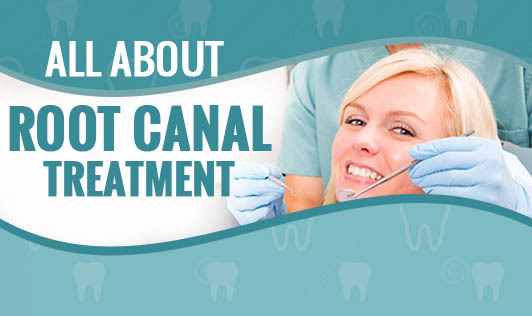 The removal of this inflamed, infected or dead pulp of the tooth is called root canal treatment. A root canal treatment is done when the pulp of your tooth is damaged because of a cracked tooth or a deep cavity or an injury to your tooth due to an accident. If an infected pulp is left untreated, it forms an abscess at the jaw bone causing pain. • Your dentist will first numb your gums with a jelly like substance and inject a local anaesthesia which would numb your teeth, gums, skin and tongue. • He would then separate the infected tooth from the others by placing a small rubber or a metal frame which would stop the tooth chips and liquid from entering your mouth. • The dentist would use a drill and other tools to remove the decayed pulp and fill it with medicine and then with permanent root canal filling. • Then he would take an impression of the tooth to make a crown that matches the drilled tooth perfectly. • He then fits the temporary crown until the permanent crown is made which would later be cemented into place. • This procedure might take 3 to 4 sittings depending on the extent of infection or decay. After a root canal treatment, the numbness of your gums, lips and tongue may remain for a few hours till the effect of anaesthesia wears off. Later, you may have pain for a day or two but that can be reduced with a painkiller prescribed by your dentist. The only alternative to root canal is tooth extraction and replacing it with a bridge, implant or a denture which are more expensive and time consuming procedures. If a tooth is extracted and not replaced, the chewing function will be impaired and the neighbouring teeth may shift. Oral hygiene is of utmost importance for a healthy living. Therefore, brush your teeth twice a day to keep them clean and go to your dentist for a complete oral check-up once in 6 months. If you know you have a cavity, do not ignore it. Visit your dentist right away!